SKU: BSSL-1SC1. 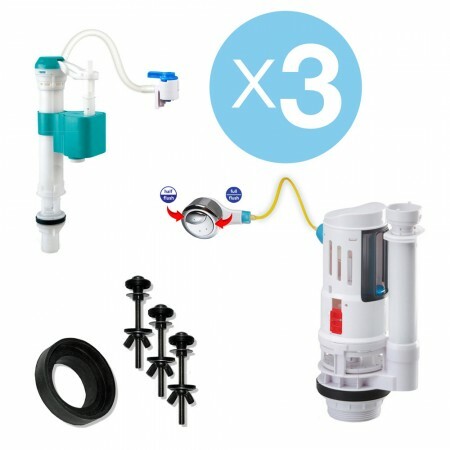 Categories: 2" Valve, 3" Valve, Featured, Lever, Retrofit Bidet Attachments (BootySaver), Toilet Type, Two Piece. THIS PRE TARIFF INTRO PRICE WILL NOT LAST > > > NOW SHIPPING: The all new BootSaver Slimline is the most inconspicuous low profile bidet on the market today. At just 5mm thick, it fits most standard Two Piece toilets (with separate tank and bowl) and has a very LARGE SIMPLE water control knob for easy use by anyone. It blends well with most any bathroom and toilet decors and connects easily to the existing toilet water line with the included standard BRASS T fitting and BRAIDED STAINLESS STEEL water line. It uses NO ELECTRICITY, so is TOTALLY SAFE in any bathroom environment. The single control is LARGE, simple to operate and clearly marked in BOLD PRINT for easy use by children and adults alike. 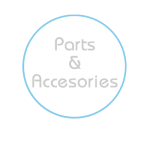 It is SELF CLEANING and constructed with basic white industrial-strength POM plastics and BRASS CERAMIC valve for years of trouble-free service. A bidet is a practical no-nonsense Green product that improves sanitation and reduces or eliminates the use of toilet paper . 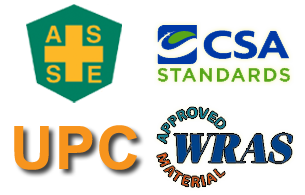 . . the manufacture of a single roll requires 1.5 pounds of wood and 37 gallons of water (source: MetaEfficient). Further, it provides soothing therapeutic relief for those with sensitive skin in their booty area. The bidet has been widely used in Europe and Asia for years, so is not a new or untested concept. It is fast catching on in the US in nicer hotels and in the home by the DIY installer who wants to add practical money saving and environmentally responsible features that don’t complicate existing appliances. 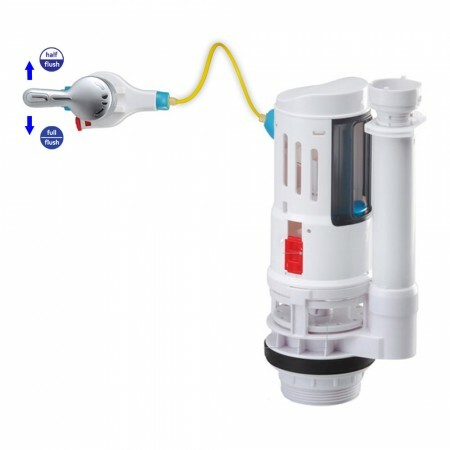 There are many bidet products to choose from, but the BootySaver SlimLine is an exclusive, carefully engineered design with the right combination of quality materials, large print easy-to-operate controls and long life with minimal maintenance. Save on toilet paper and save your booty at the same time with the BootySaver. 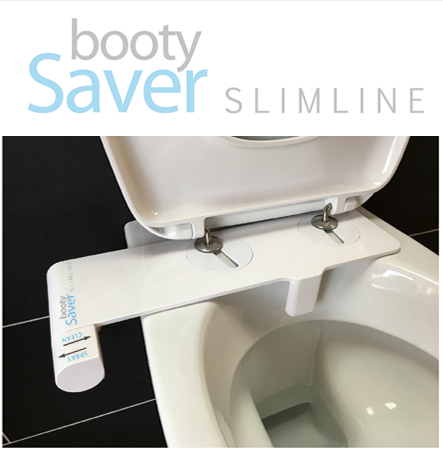 5 reviews for BootySaver SlimLine 5mm Euro Bidet – SUPER LOW INTRO PRICE ! ! ! Wet and Wild ! ! ! The instructions are fairly straight forward. 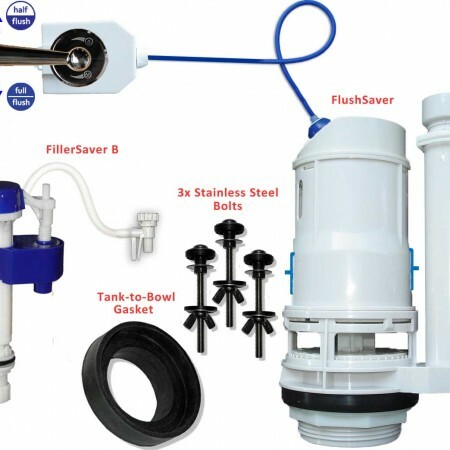 You’re basically going to install a T-fitting onto the water line that goes to your toilet tank. 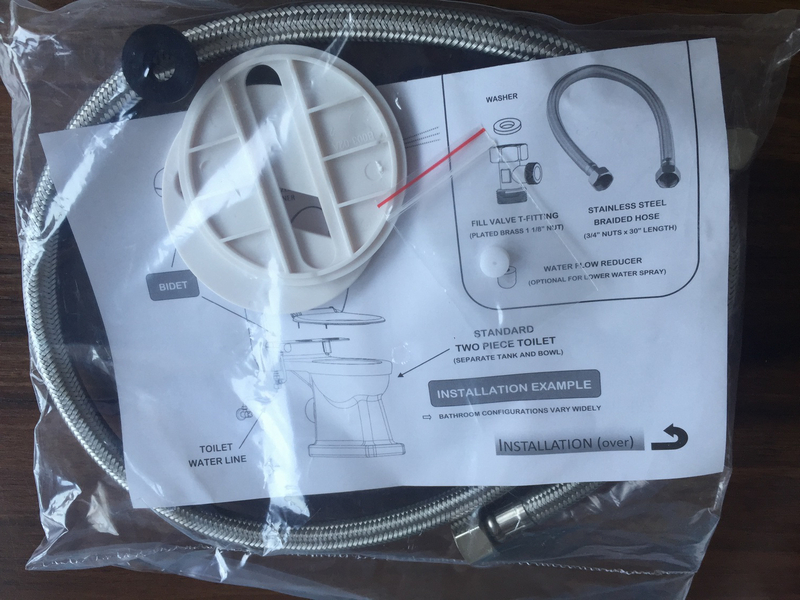 From the T, you attach an extra line to the VERY slender bidet attachment that attaches under your toilet seat using the securing fasteners you already have there. 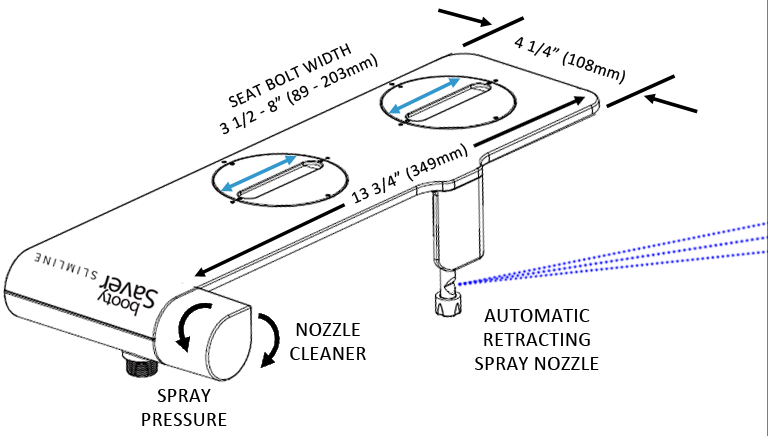 The bidet has two round, adjustable inserts that allow you to essentially line up to a variety of mounting hole distances. 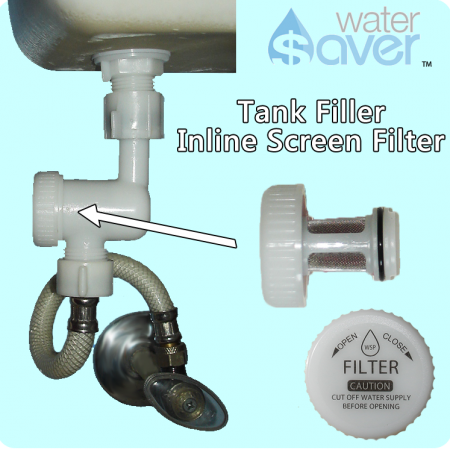 You line it up, snug it down, turn off the water line to your toilet, install the T along with a black rubber O-gasket on the upper portion, between your tank and the T, then turn the water back on. So let’s talk performance, experience. I have to tell you — I travel internationally a LOT for work. I’ve used a plenty of bidets — mostly out of curiosity. The traditional stand-alone bidet you find in Europe is one of two designs. The most common is a horizontal jet. This tends to give kind of a weird situation where you end up, ahem, having to move your rear end around and make the dirty areas more “accessible” to the stream of water. Then there are the ones that shoot up from RIGHT underneath the old exit-hatch. Those are effective, but can certainly be a bit more abrupt in terms of your experience. The Bootysaver has water jet aimed at the area in question at the *perfect* angle with adjustable pressure to match how aggressive you want it to be. On a standard bowl or even one of the ones with a elongated or notched-front seat, the angle should work. Edit: So over a month later and no leaks. I’ve become such a fanatic about this thing that I refuse to use our downstairs bathroom when a log is coming down the hatch. I do have to turn my body slightly and hunt ever-so-slightly to get the jet in the right place, but overall this is fantastic. There are a ton of add-on bidets out there, so it’s impossible to decide which one to get, especially if you’ve never owned one. But let me tell you I’ve looked around and this is the BEST DEAL at the BEST PRICE. Nothing else comes close. Just the braided stainless water line alone cost $15 at Home Depot. So if you’ve been thinking to trying a bidet, you can’t go wrong with this one at this price. Not sure why they are offering this deal, but can’t last. Besides the price, like the ad says, it’s slim and small with no frills, so is easy to use and almost invisible on our toilet. It was easy to install and works great. I just researched these bidets over on Amazon and this is the best deal hands down. 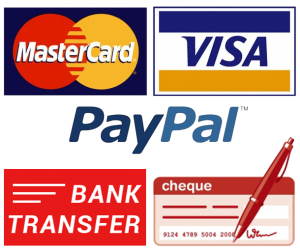 There is nothing over there for less than $25 and many are too big, have useless features or are too expensive. This one has just what you need with quality hardware. Perfect. Need that “special rinse” feeling but don’t want some big obtrusive contraption on your toilet? This is the perfect no frills bidet Just one simple knob does the rinse in one direction and cleans the spray nozzle in the other other. Totally easy to operate. The unit is thin but sturdy with excellent hardware . . . everything is included for installation. Taking off one star only because I think there should be other color choices . . .